It would appear that the boys are as happy as pigs rolling in cool mud on a hot sunny day – and yes, the days are warm and sunny. Pat and Garry survived their trip from New Zealand to France, via Brisbane, Dubai and Geneva, and are now ready to risk life and limb – and lungs, on the country roads and hills of France. After much practice, Pat has been able to master the ON / OFF button of his GoPro – and surprise, surprise, France has internet access. We do have footage of Pat and Garry negotiating country traffic and cafes; and we have the word that French people are quite happy to speak to people wearing clothing with NZ insignia. 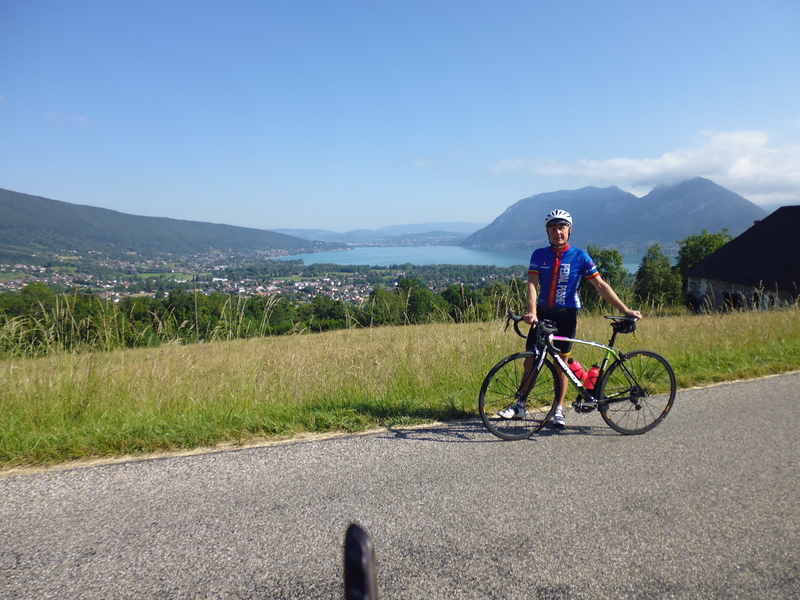 The first major warm up ride was a quick jaunt to the Semnoz Summit (1700m); just for kicks Garry decided to add an extra 2km 200m climb – the message gets confusing at this point, as it appears, they had no idea where they were. However, they expertly discovered a terrific steep 20km climb to a ski field where they had a panoramic view of Mont Blanc! Another coke to give themselves the illusion of good health, and recovery, and they had a smooth, fast, and exhilarating 20km downhill ride back into Annecy. As a prelude to the real riding, it appears that the training has prepared the boys well for their 700km mountainous journey to Menton. Tagged All Blacks, France, Menton, new zealand, new zealand rugby museum, Tour de France, William Webb EllisBookmark the permalink. Hi Mike. I will pass your note onto lads – they are having a brilliant time. Pat was telling me, over a Skype conversation an hour ago (5.30pm NZT 23.6.14), that it isn’t the climbs that are doing him in, its the heat – 28 – 31 C. Keeping in mind, Pat is still managing to do 2 out of every three climb (and they are huge) and Garry is doing every single one – so the heat might be a killer, they seem to be surviving just fine.